Emotional as well as economic changes often create the need for a change in fashion, and the textile world must be ready with the cloth. The overcoat styles which are classified within the industry today as staples had their origin in circumstances which vary in many respects but have the common bond of functional need. Demonstrating the philosophy that as the world changes in manner or in mood, fabrics must change. We illustrate several instances wherein a new set of conditions created both the opportunity and the necessity for overcoats which are commonly worn today … but were novel departures at the time of their conception. The Polo Coat. So far as written record reaches, it is believed that the soft, fine underhair of the camel was used to weave warm and luxurious cloths for the Tartar and Mongolian chiefs. Merchants whose caravans traveled through the passes of India to the north brought back lengths of the precious cloth for use by Indian potentates. Many centuries later, when British cavalry officers in India took up polo to while away their tedious stay, they became acquainted with camel’s hair cloth and discovered that it made up into an excellent lightweight yet warm wrap for wear between chukkers or after the strenuous game. 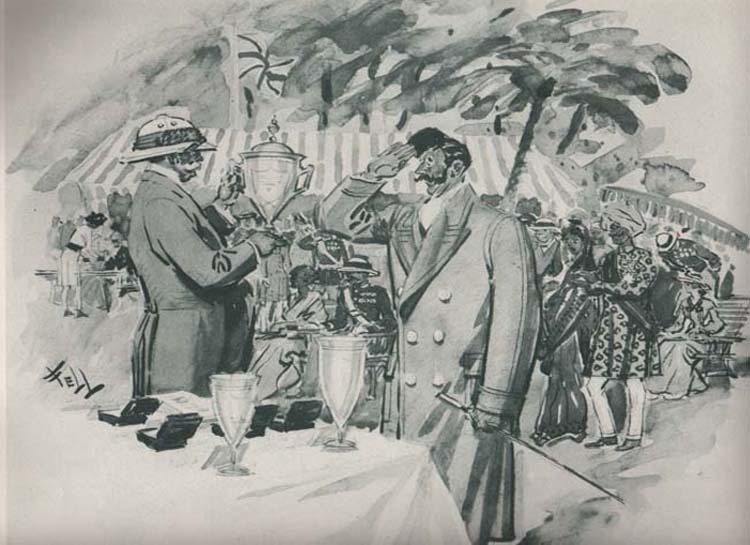 The Polo Coat became almost a uniform for polo players, not only in India but in England, and it was not long before there was established quite a trade for this type of garment. Naturally the American polo set picked up the idea; Tommy Hitchcock wore one at Meadowbrook, his younger brother liked it well enough to have a copy made to wear at Yale … and the Polo Coat was on its way to becoming the fastest selling style in men’s overcoats. Worumbo Mills developed a cloth of special qualifications for this type of garment, and even registered the name Polo Cloth for its fabric; a fine job of creating a special fabric to meet this specific need was also done by other mills, notably Stroock. The Duffle Coat. This extremely pratical, knee-length and hooded coat was originally created from blanket cloth and worn by Norwegian fishermen as a protection against the icy blasts of the North Sea. 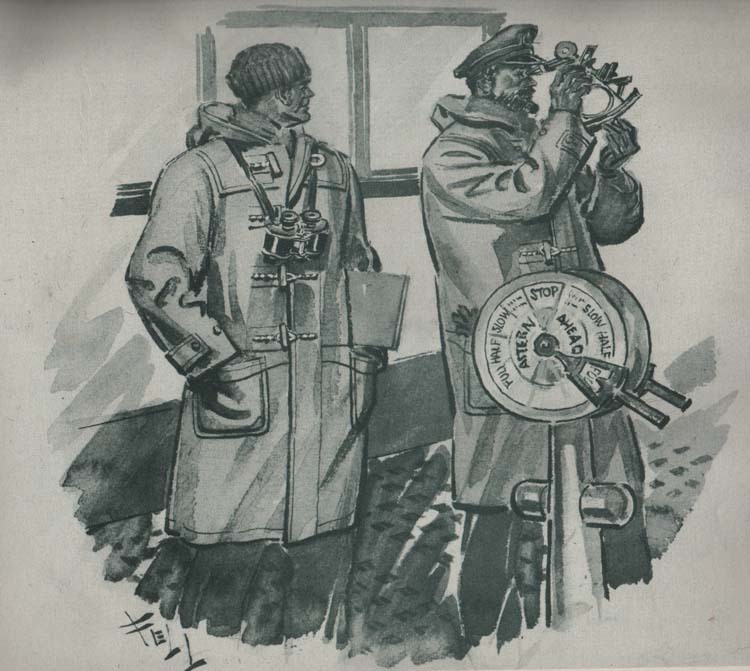 The British navy found the garment to be warm and comfortable, and the Duffle Coat was very popular with both officers and men of His Majesty’s fleet during World War II. 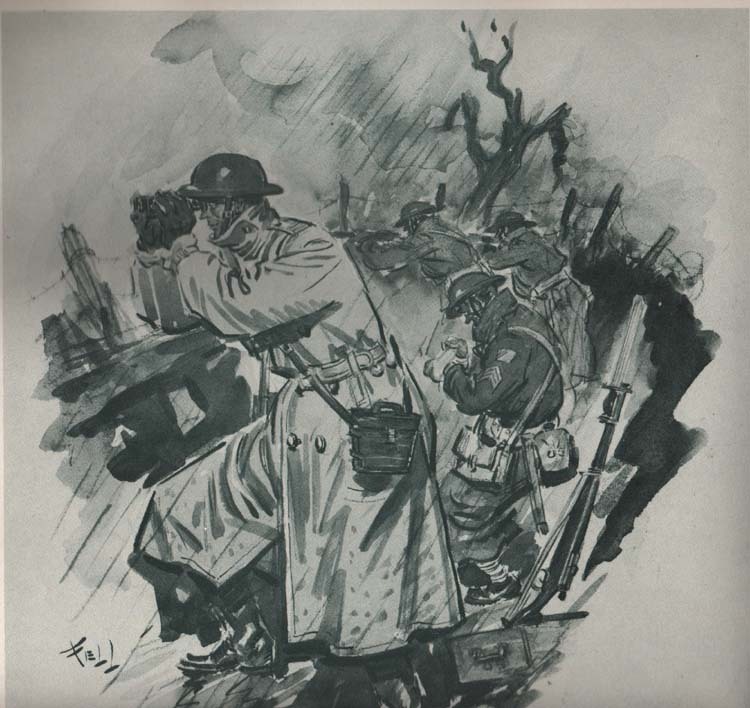 After the war the young fashion-setting set of the Continent adopted the Duffle Coat as an extra, swagger garment for wear in bad wether; it has been brought to the United States recently, and in cooperation with Baxter Mills which loomed a special cloth suited to American climatic conditions, one manufacturer has already succeeded in geting the Duffle Coat well on the way to becoming an all-American fashion. Really British wool coats were my parents and myself favourites but are not easy to get,at least in Argentina anymore.I would be very pleased if you can get me the pathway to get them nowa days. Thak you and I loved your script.